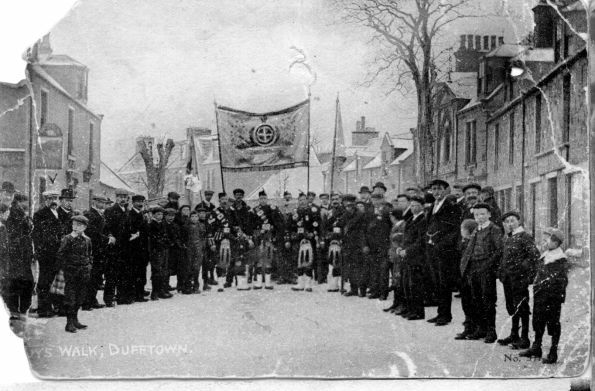 The picters on this page and many more photo's o Dufftown are avalable for sale from Robin MacLennan. Al proceeds go to the Dufftown and District Highland games and the Dufftown pipe band. The disc contains photos from the Hospital Centenary Exhibition. Millennium Exhibition, 2007 Exhibition, Pipe Bands 60th Birthday Battle and the recent School Reunion. It originally started with 300 photos old and modern, now the collection has nearly 1500 images. If you would like to purchase a disc, contact Robin . 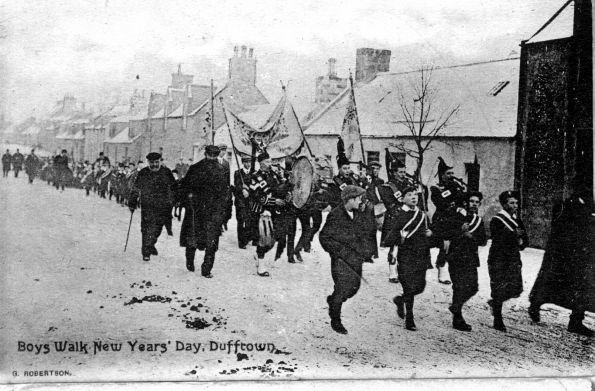 The next news is that Robin is working on a film of the Dufftown pipe band over the years. It will be avaliable soon. 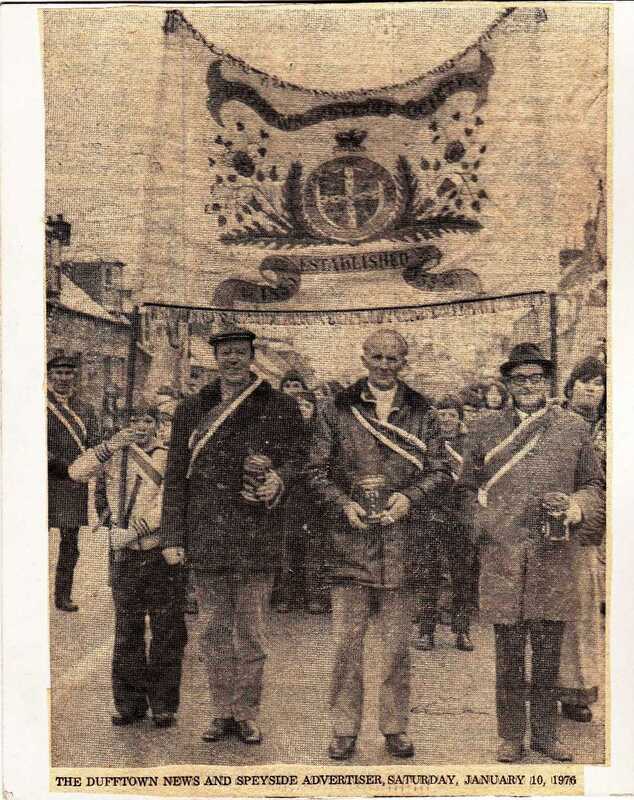 Three Dufftown exiles return home to take part in the walk their first since 1943/40 they are Brothers Angus and Ronald Gordon,Rugby with John Shewan, centre from Liverpool. In the picter below you can see the ancient weapons that used to be kerried in the parade. 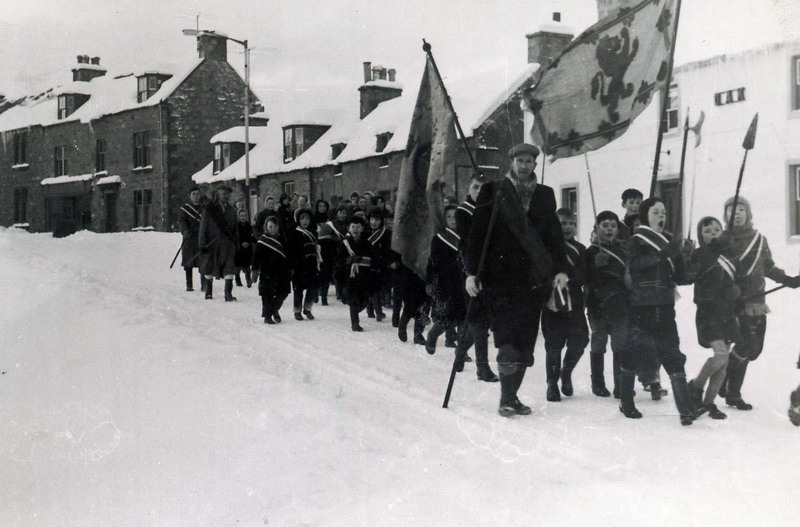 It Look's affa cauld that day an I winner if the wee cheil in the balaclava sticking oot his tongue got a walloping fae his Dad when he seen the picter. The Oak looks jist the same as it diz noo! 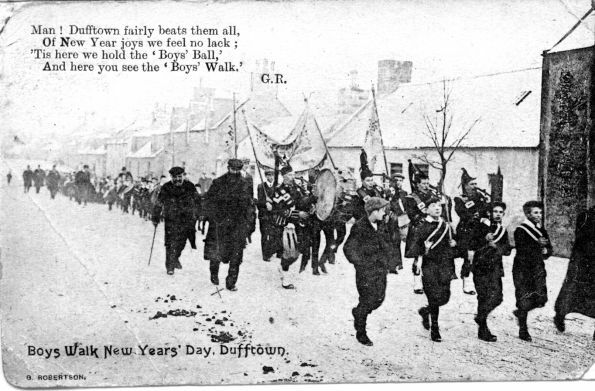 This picter is fae 1929 and a good few end names here can still be heard aroon Dufftown. 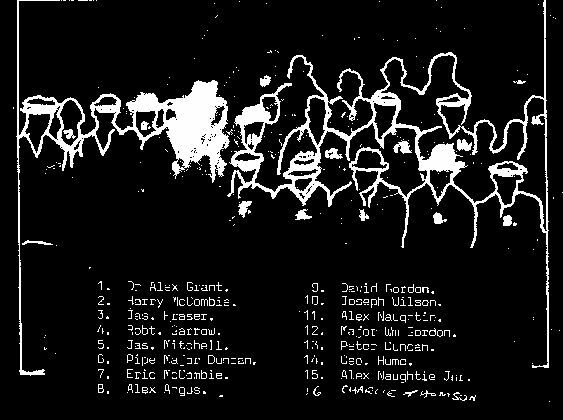 Dr Alex Grant, H Duncan, A Naughtie, Major W Gordon, G Hume, Provist macPherson, J Thomson. 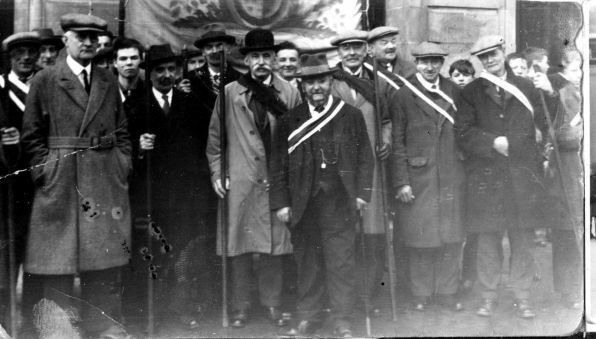 This one was taken prior to 1911 Alex beg is in there somewhere he died the following year. On the back o the postcard is written. 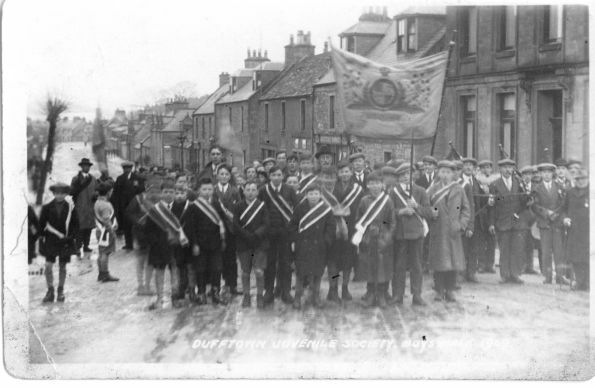 Dufftown JUVENILES' SOCIETY was founded in 1835 and was wound up every ten years untill 1873 when the annual meeting was changed to 1st January except should that fall on a Saturday or Sunday then the meeting would be held on the following Monday. Annual membership was six and a quarter old pence and a Boys walk and Ball were held yearly. 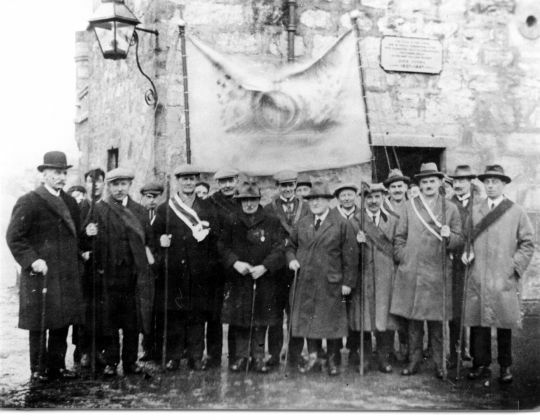 On 26th January,1849 the membership was 333. Extract from the 3rd statistical account of Scotland. 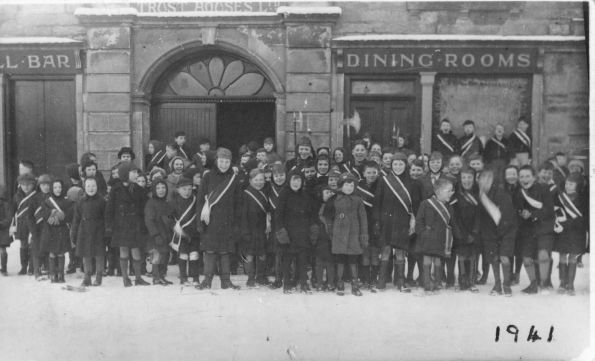 The Picture below fae 1941 is taken ootside the auld toon hall. A mannie fae Lhanbryde myn't aboot the tin bath o lemonade that was carried in to the bairns pairty, a rare treat in those days. Abody got a drink from the same cup which wiz like a big ladel. They cried it the burnt ale for some reason. Anither wifie fae Rothes telt me aboot the Ball at night. She said they cim roon wi zink pails filled wi juice which ye could buy. Some folk used this to water doon the half jillicks which were secreted on their personage, So nae drink alowed in the hall back then either.